The commodity downturn represents an opportunity to invest in good practices that will help countries break from a legacy of inadequate governance and legal structures, weak enforcement of tax legislation and imprudent revenue management. Making improvements in establishing and enforcing strong governance and fiscal frameworks now to capture resource rents will also pay off when mineral prices rise again. A critical area of reform is to counter aggressive tax planning and tax evasion. Tax planning, or tax avoidance, is the use of legal methods to minimize the amount of income tax owed by multinational enterprises (MNEs). In the absence of rigorous controls, some MNEs also employ illegal methods to reduce their taxable income by knowingly and illegally misrepresenting their transactions. This is called tax evasion. The Africa Progress Panel has identified crossborder transactions between related parties as a major threat to the tax base of African countries. One of the principal vectors of losses in these transactions is transfer pricing, which occurs when one company sells a good or service to another related company. Because these transactions are internal, they are not subject to ordinary market pricing and can be used by MNEs to shift profits to low-tax jurisdictions. Many African countries have begun to put legal rules on the taxation of cross-border transactions in place. Most of these rules require taxpayers to price transactions between related parties as if they were taking place between unrelated parties. This “arm’s length principle” is at the core of most global standards on controlling transfer pricing, led by the Organisation for Economic Co-operation and Development (OECD). However, compliance with the letter and the spirit of these rules depends on the administrative capacity of countries to actively enforce legislation. 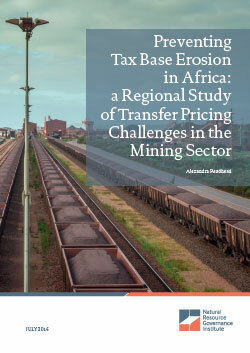 Preliminary results from research by the Institute for Mining for Development Centre suggest that out of 26 countries surveyed in Africa, most do not have the requisite capacity to implement effective transfer pricing rules. This study assesses the development and implementation of rules to monitor transfer pricing in the mining sector in countries with varied experiences. NRGI has also published case studies on transfer pricing in Ghana, Guinea, Sierra Leone, Tanzania and Zambia. Preventing Tax Base Erosion in Africa: A Regional Study of Transfer Pricing is available in French here. Preventing Tax Base Erosion In Africa Paper Launch in Washington, D.C.